Allen: Tell us something personal about yourself, your family life, schools you went to, etc. Ben Quinlan: I grew up in the Northern Beaches of Sydney with my parents and brother and sister. We grew up watching a lot of TV and playing GameBoys and Playstation. Allen: What were some of the first comic book you ever read? Ben Quinlan: I think first comics I bought were Watchmen and The Dark Knight Returns - because they're the ones that I'd always heard people talk about. Not knowing much about comics at that stage, a lot of Watchmen went over my head, but that's the fun of re reads! Allen: How did you get involved in the comic book industry? Ben Quinlan: I don't know that I really am involved! I always liked writing and telling stories, and drawing was something I'd done since a kid (I used to sell drawings of Pokemon in the schoolyard!). So when I realised that making a comic was something that really anyone could do, I jumped right in! I had stories I wanted to tell, and now I had a platform. Allen: Do you have others in your family working in comic book industry? Ben Quinlan: I don't think anyone in my family knows how to read a comic. 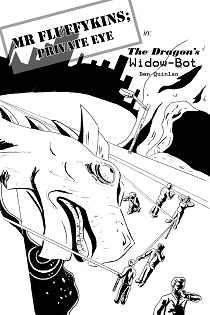 Ben Quinlan: Mr Fluffykins was an entry to an anthology that didn't really happen, where all the stories had to involve a cat, a dragon, an umbrella and a robot. So naturally I wrote a noir dragon murder mystery solved by a detective cat. Takes One to Know One as a story I'd been thinking about for years. What if everything around you was fake? What if someone had paid off everyone in your life to act in a certain way? Why would they do that, and is it necessarily a bad thing? Allen: Who are some of the characters in "Fluffykins" and "Takes One to Know One"? Ben Quinlan: Mr Fluffykins is a hardboiled detective, who happens to be an anthropomorphic cat. 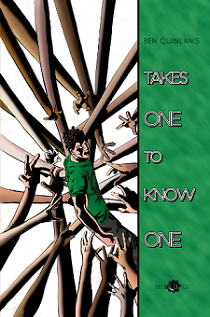 T.J. Riprovare is the main character of Takes One to Know One, who is an average kid trying to make is way through high school. He's getting perfect grades, lots of friends, and is in a band that's about to get a record deal. But is any of it genuine? What's real? Allen: Tell me how it went for Kickstarter campaign for your newest graphic novel "Black and Blue". What sort of comic is "Black and Blue"? Ben Quinlan: The Kickstarter went amazingly! I didn't know if we'd be able to get funded, with the book not being finished yet, but people were very supportive. 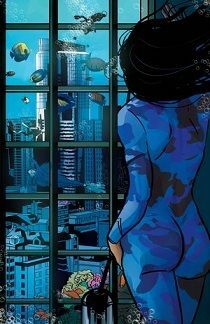 Black and Blue is a double sided graphic novel. It has two beginnings, and one end at the centre of the book. It's set after aliens have invaded and taken most of the population of Earth. We have discovered their weakness, salt water. So we flooded the planet, and now we live underwater. The book follows Mattaya Black, a young woman who has been conscripted into the Aqua Marines, and Lazuli, a young alien who is forced to provide food for his people. Allen: When can we find this comic book on the stands? Or what is the best way to get your comic books? 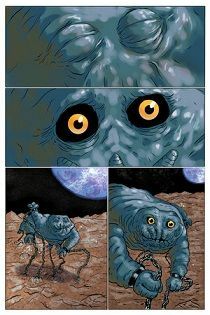 Ben Quinlan: Preorders are available now at www.inklingcomics.com/blackandblue at a discounted price! We're hoping to have it out towards the end of the year. After that it'll be on inklingcomics.com in digital form and we'll have it at conventions around Australia. If you're a publisher or distributor and you're interested in getting on board, get in touch! Allen: Are you the writer and artist of all your comic book publications? Ben Quinlan: I've written and drawn most of my work, but I'm solely the writer of Black and Blue. We've got some amazing artists helping us out in Nathan Seabolt and Beth Varni. Allen: Tell me about your publication company. Ben Quinlan: Hahah it's not so much as a company, as a logo to put on the top of my books. It's helpful to put projects out under a banner, but it's more of an imprint if anything. Allen: How did the concept for some of your recent stories come about? Ben Quinlan: I get a lot of inspiration from words and puns, but the first idea for Black and Blue came when I was snorkelling, looking at coral and the fish and picturing all of that surrounding a city. Allen: Who are some of your comic book Mentors or inspirations? Ben Quinlan: Art wise I love Micheal Lark, John Paul Leon, Fiona Staples, Darwyn Cooke... there's too many amazing artists out there to name! Writing wise, Charles Soule, Tom Taylor, Joshua Williamson, again there's a multitude of incredibly talented people working at the moment. Allen: What conventions will you be attending or have attended? Ben Quinlan: I'm usually at the Sydney Supernova's and Oz Comic Con's, and I try to get to some smaller ones too, Comic Gong, Comic Con-versation. Occasionally I'll head down to Melbourne too, but I've yet to venture to an overseas con! Allen: How can someone contact you? Allen: What is your website URL address? Allen: What are your hobbies and recreational activities? Ben Quinlan: Drawing and writing is all I have time for! Allen: If you can have 6 dinner guests, 3 fictional and 3 real-life from any time period, who would those 6 people be and why? Ben Quinlan: Ok this is a question that deserves a lot more thought, but the first that came to my mind were: Kurt Cobain, Dan Harmon, Grant Morrison, Barry Allen, Wally West, and just to make things interesting... Godzilla. Allen: If you could go into any time machine, what year would you stop at and tell us why. Ben Quinlan: This just raises more questions though... Can I come back? Do my actions affect my own timeline or create new ones? Assuming I can come back, I'd go into the future about 40 years and memorise what companies were successful, come back and invest! Allen: What TV shows, movies, cartoons do you like? Allen: What books do you enjoy? Ben Quinlan: I'm loving Claire North at the moment, she's a great author. Recently read Six Wakes by Mur Lafferty which was also great. Allen: What comic books do you read now? Ben Quinlan: Monthly I read Flash, Lazarus, Green Lanterns, and a few others digitally. Allen: What gives you your creative energy? Ben Quinlan: Well written stories, whether they be TV, movies, books or comics. Allen: Do you have any future comics in the works? Ben Quinlan: Lots! Currently drawing a graphic novel, and in the development process for writing another couple. Allen: Tell me about your musical career? How can someone get your musical works? Ben Quinlan: My music is largely experimental stuff, after I couldn't do the stuff I wanted to do in bands. You can get it for free at inklingcomics.com I like to describe it as glitchy, punky, literary music. Lots of puns and word play with big guitars and electronic beats. Allen: This ends the interview, any encouraging words of wisdom? Ben Quinlan: Thanks! Go make a thing!